« Stop the Presses, Europe’s Doing the Right Thing on Failed Banks! The late, great Margaret Thatcher famously said that “Socialist governments…always run out of other people’s money” and “I love the smell of napalm in the morning” is an iconic line from Apocalypse Now. And that’s about to happen in France. The burden of government spending is enormous, with the public sector consuming 57 percent of economic output. That’s more than either Greece or Sweden! If something isn’t done, France will suffer a Greek-style crisis as investors lose trust in the government’s ability to pay its bills. The situation is so bad that even the country’s Socialist President claims that he plans to cut spending, but he faces a revolt in his own party from those who refuse to recognize reality. Here are some excerpts from a column in the UK-based Telegraph. President Francois Hollande has already angered much of his own Socialist base with plans to cut spending next year in absolute terms for the first time since 1958, but this may be just start of the battle. The Cour des Comptes said France is not even “halfway” through its fiscal squeeze. …”France is drifting away. Like a receeding wave, it is retreating little by little from the global economy, imperceptibly in the past, but visibly so today,” said Jean-Pierre Letartre, Ernst & Young’s chief in France. …The government has pencilled in economic contraction of 0.3pc this year, with a weak recovery starting in the second half, but a chorus of private economists fear far worse if there is any outside shock. “It could be as much as minus 1.5pc,” said Jean-Michel Six from Standard & Poor’s. …Mr Hollande has so far gone along with EU austerity demands, backing away from his pledge for a New Deal growth strategy in the elections last year. But his poll ratings have crashed at the fastest rate ever for a new president, and much of his own party is near revolt. 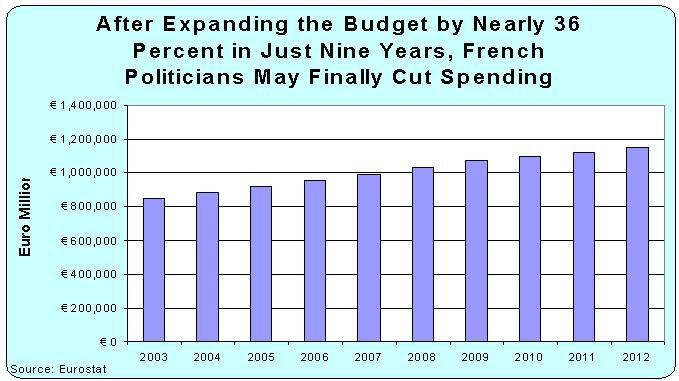 I’ll be surprised if France actually follows through with genuine spending cuts, but you can see from this chart that the time for fiscal restraint is long overdue. To be somewhat optimistic, it’s worth noting that governments will do the right thing when there’s no other alternative. Greece, for instance, has cut spending three years in a row, bringing the budget down from 124 billion euro in 2009 to 106 billion euro last year. Unfortunately, there have also been big tax hikes, and the overall level of spending is still about where it was in 2007, so Greece is far from a role model. But at least the era of ever-rising outlays has ended. And I’ve already pointed out that the Baltic nations are a role model since they made genuine spending cuts the moment the crisis began and they’re now enjoying an economic rebound. I realize this will be the understatement of the year, but France is not going to be the new Estonia. Unlike the Canadian Liberal Party or Australian Labor Party, it does not appear that the Socialist Party in France is willing to recognize reality and do the right thing. But the good news is that they don’t have any room to raise taxes. Successful people already are leaving the country because of punitive tax rates, and I suspect even President Hollande privately understands that France is on the wrong side of the Laffer Curve. So I expect there will be a fight. On one side, we’ll have the rational statists who recognize that spending cuts are needed to avoided a fiscal crisis. On the other side, we’ll have the irrational statists who blindly think more money can be squeezed from the rich with more class-warfare tax policy. Let’s hope for heavy casualties on both sides. P.S. There’s a lot to like about France, and I reported a few years ago that it was ranked as the top nation for good living. But that’s only if you already are rich. Now that the French national sport is taxation, productive people who want to become rich have a big incentive to go someplace else. As a Frenchman, I concur completely. By the way, I’m 22, just recently graduated from one of the country’s top universities at virtually no personal cost, and will be leaving in a couple of months since I got far better opportunities outside France, and I’m not willing to even countenance surrendering 75% of my wages on a monthly basis. I’m not mentioning the 75% marginal rate the socialists wanted to implement before they were overruled by the constitutional court, but the fact every French employee (except for minimum wage earners) pays 25% of his gross income in social contributions on monthly basis, and the employer tops that with 45 to 50% of said gross income in further social contributions. That adds up to 75%. So, Margaret Thatcher wasn’t exactly joking when she injoined some of their ministers to don a beret and go live in France so they could surrender 80% of their income to the French government. Government is one third smaller (42% of GDP) in my new country, and I can sense that whenever I’m looking at a payslip (53 lines in France). you can almost hear “highway to hell” playing in the background…. Just give the French some time. They’ll surrender. Taxing the rich in France is their national past time. Mitterrand taxed the super rich and had no success. Coming to America near you….soon!